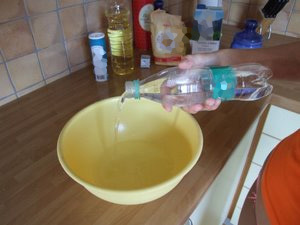 Pour 1 dl (0.5 cup) of sparkling mineral water into a big bowl. It can be a "normal" or tap water as well. Be sure it's warm. 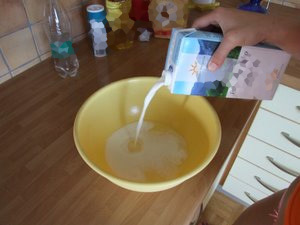 Add 1 dl (0.5 cup) of milk. Add a bit of yeast. But only a little bit, you don't want your pizza dough to be as thick as a bread. Pinch of sugar and a pinch or two of salt. Cover the bowl with a cloth and wait for about 20 minutes. 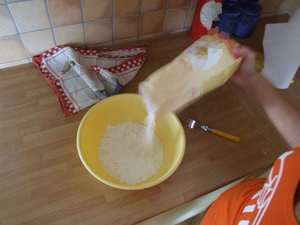 After 20 minutes add the flour. Wash your hands and start kneading the dough. Knead so long until the flour doesn't stick to your hands anymore. 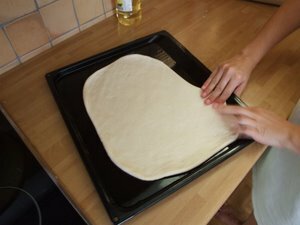 Click here to watch a short how to knead a pizza dough video. When you are done kneading, cover the dough with a cloth. Leave it rise for about 3 to 4 hours for the best result. 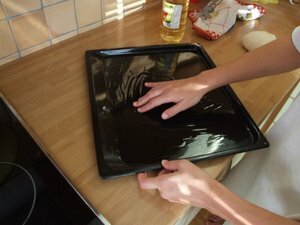 Pour a few drops of oil on to the baking tray and spread it evenly. 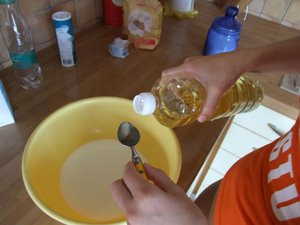 If you over did it with the oil, you can simply use a paper towel to remove the excessive oil. Now stretch the dough and make it as thing as possible. Not too thin though, you don't want any holes in it. 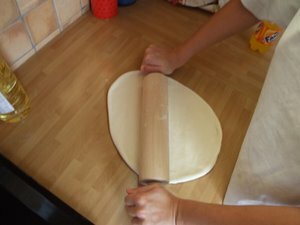 I used the roller to make the dough flat. Put the dough in to the tray and start stretching it to all the edges. Take the cheese and grate it to a plate. 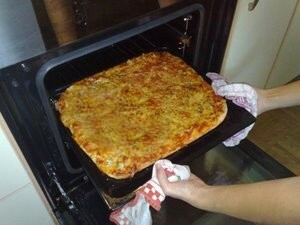 Grate as much of the cheese you would like to have on your pizza. 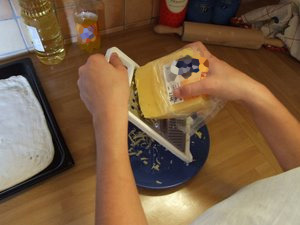 You can use cheddar cheese, mozzarella or a similar sort of cheese. 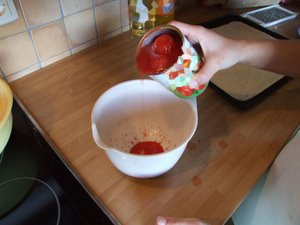 Open the can of tomato pulp can or glass and pour into the bowl. 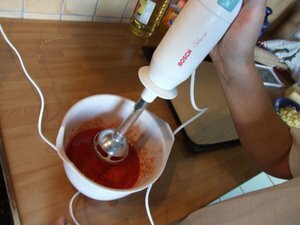 If your tomato pulp contains tomato pieces, use a stick mixer to turn the pulp into puree. 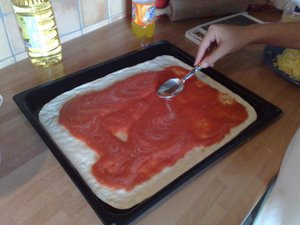 You can skip this step if you already have a tomato puree. 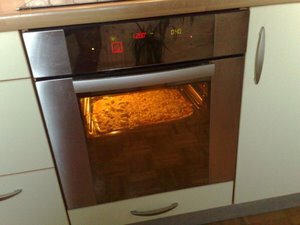 Meanwhile, turn on the oven and set the temperature to 220 degrees Celsius (430 degrees Fahrenheit). 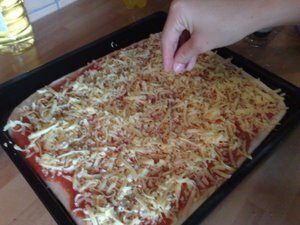 ... add the cheese and oregano evenly all over the pizza. Don't over do it with oregano. When the oven reached the temperature you set, carefully shove in the pizza tray and let it bake for about 15 minutes. 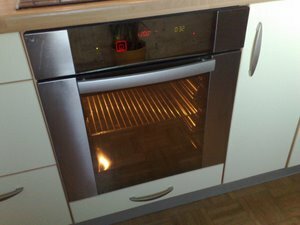 Check your pizza after 10 minutes, some oven get really hot and may burn the pizza. 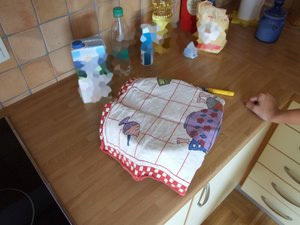 Use the kitchen gloves or cloths and carefully take the pizza tray out of the oven. Cut it, eat it and enjoy it. Hey, great recipe. I love that you have made everything at home and I will probably make it tommorow.